Keeping the 2018 Toyota Prius under $30,000 isn’t hard—a Prius Three Touring offers everything we need at just over $29,000. The 2018 Toyota Prius quietly marches on this year—literally and figuratively. Not much has changed from last year, beyond a larger touchscreen in top-tier models and Prius Prime plug-in versions. The 2018 Prius is two years removed from a total overhaul and hitting its (fuel-efficient) stride. We break down the Prius into two flavors: Prius Prime (which is the plug-in hybrid) and Prius “Plain”—our name, not theirs. The regular Prius is offered in Prius One, Prius Two, Prius Two Eco, Prius Three, and Prius Four trim levels, the latter two offering “Touring” options with a few more niceties. (The Prius Two Eco cuts weight for better fuel economy ratings.) The Prius Prime is offered in Plus, Premium, and Advanced trim levels. The Prius Prime looks better to our eyes, if only because it smooths over the stilted edges from the Prius Plain. There are many angles and shapes in the Prius’s face, flanks, and fanny. It’s a jumble of lines wrapped around the iconic liftback shape that the Prius has largely cornered. Inside, it’s similarly busy but thankfully upgraded from outgoing generations. 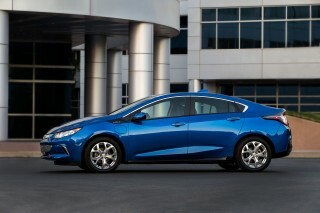 The performance follows the same logic as it always has: a frugal inline-4 teamed with batteries for maximum mileage. The total system output is only 121 horsepower, tasked with motivating more than 3,000 pounds of mass. 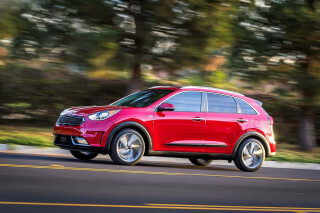 Its transmission, steering, and braking prioritize efficiency—and we’re fine with that. The Prius doesn’t claim to be anything else. Opt for the Prius Prime and its bigger plug-in batteries accommodate up to 25 miles of all-electric driving, far less than a Chevy Volt, but likely enough for urban commutes to work. The interior is better this time around for honest-to-goodness seating for full-size adults and some modicum of comfort. The liftback affords more cargo capacity than normal sedans—more than 27 cubic feet in most examples. The Prius Plain nominally seats five, although four will fit better. The Prius Prime doesn’t offer a rear-seat hump—it’s just four only. Toyota’s standard suite of advanced safety features, which was added last year, complements an impressive crash-test score. Federal testers give the Prius a five-star overall rating, and the IIHS calls it a Top Safety Pick. 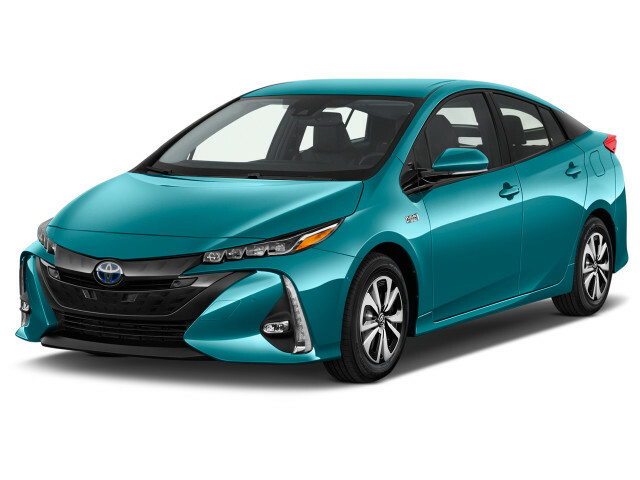 The numbers that really matter: 52 mpg combined in Prius Plain, 56 mpg combined in Prius Two Eco; 54 mpg combined in Prius Prime with a 25-mile EV-only range. The 2018 Toyota Prius has a face that only hybrid aficionados could love. The 2018 Toyota Prius skips our trends in hopes that taste will come around again in the way, say, leg warmers and cut-off tees won’t get us kicked out of our favorite restaurant. Again. It’s not for a lack of trying—by our eyes, the Prius just tries too hard. The newest generation has a lower and sleeker nose than before, which gives it a sharper entry than the rounded shapes from yesteryear. Along the sides, the Prius uses several tricks and slashes to break up the slab-sided looks from outgoing cars. The rear roof pillar is black, which give the Prius a “floating roofline” but the shape starts to fall apart at the rear. The rear end is high, as before, with chevron-shaped taillight lenses at the top outer corners of the tail. But those taillights have tails of their own, making them almost into question marks that point down toward the ground, drawing attention to the height of the tail, despite a blacked-out lower section of the rear bumper cover. To many eyes, the rear end has too many conflicting elements, turning it into a jumbled mess—there’s just so much to take in. The inside is heavily styled as well, with a mix of soft-touch surfaces and hard plastics that rise toward the center stack. A newly added 11.6-inch touchscreen sits between driver and passenger in top Prius trim levels, although the high-gloss plastics that festoons the gear selector and cupholder remains. It just won’t age well, according to us. The 2018 Toyota Prius doesn’t prioritize performance. Yesterday’s news: A 2018 Toyota Prius is neither fast nor fun to drive. Performance was never the point anyway. Hybrid is the name, efficiency is the game. We’re not bearish on the whole package, really. The new Prius is lower, longer, and wider than the old model, which boosts outward vision and to lower the center of gravity for a sharper ride. The Prius is still powered by a 1.8-liter inline-4 that makes 95 horsepower and 53-kw electric motor for a combined output of 121 hp. 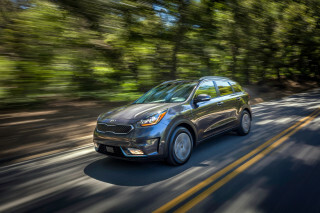 That’s paired to a continuously variable transmission that prioritizes efficiency above fun, which makes sense given the application. For the first time, two different battery packs are offered in the Prius. The Prius Two Eco uses a 1.2-kwh nickel-metal-hydride pack that has been used in multiple generations of the Prius. Every other Prius uses a 0.75-kwh lithium-ion pack that features a lighter, more compact unit that effectively uses more of its charge. The Prius is built on Toyota’s newest platform and benefits from a more rigid frame. It lacks the floppiness from previous iterations, but its steering feel is largely devoid of any interest for the driver. The braking—regenerative to friction—is fairly seamless and confident. Owners have faith that driving a Prius will help humanity, but at least sitting in the hybrid doesn’t feel like going to church anymore. The 2018 Toyota Prius is a marked improvement in overall comfort from previous generations—especially its front seats. The newest Prius is more comfortable than previous iterations. The front seats have better bolstering and deeper bottoms than the last generation’s pews. It’s a better view too. The Prius ditches the last-generation’s outdated information screens in favor of high-definition color displays that we’d expect from a car built in this decade. The backseat in the Prius officially seats three (just two in the Prius Prime), which is possible, but two adults will be more comfortable on long trips. The 33.4 inches of rear leg room on paper is believable, but it’s head space that may kink taller riders more. The sloped roofline cuts into head space, so 6-footers will need short torsos to fit comfortably for long. The sloped roofline and liftback body style has its benefits: more interior cargo room. The Prius boasts more than 27 cubic feet of cargo room. The 2018 Toyota Prius boasts an impressive set of crash-test scores and standard safety equipment. Despite its small size and frugality-first focus, the 2018 Toyota Prius packs a punch for any wall it may run into. Assuming it even gets there first. 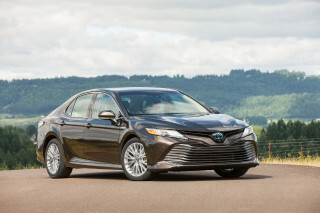 Last year, Toyota made standard a suite of advanced safety systems on most of the new vehicles it sells. 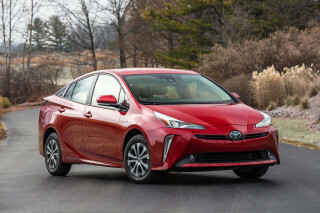 The IIHS calls the Prius a Top Safety Pick, with “Good” scores on all available crash tests, and an “Acceptable” rating for its LED headlights. Federal testers largely agree and gave the Prius a top five-star rating, but noted four stars for frontal crash safety. 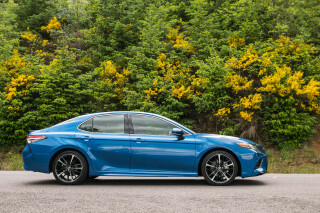 All trim levels get Toyota Safety Sense-P, which includes forward collision warning with automatic emergency braking, active lane control, automatic high beams, and adaptive cruise control. The IIHS rates the system as “Superior” in avoiding low- (12 mph) and high-speed (25 mph) crashes. Blind-spot monitors, a head-up display, and parking sensors are reserved for top models. Outward vision in the Prius isn’t ideal—the rear window is still split and the rear roof pillar is extra chunky, good for peanut butter but bad for blind spots. All trim levels of the Prius get a standard rearview camera. A tablet-style touchscreen from the Prius Prime awaits top-level 2018 Prius Plain buyers this year. The news this year is that top trims of the “Prius Plain” get a tablet-sized touchscreen planted front and center in the car, which was lifted from last year’s Prius Prime. It’s slick, albeit not well integrated into the car’s dashboard. From there, the Prius is offered in Prius Two, Prius Two Eco, Prius Three, Prius Three Touring, Prius Four, and Prius Four Touring trim levels. The Prius Prime is offered in Plus, Premium, and Advanced trim levels. The Prius c is covered separately. Prius Two adds a split-folding rear seat for more cargo room and small creature comforts missing from the fleet-focused Prius One such as front seatback pockets and a rear wiper. Prius Two Eco swaps the Prius One and Prius Two’s nickel-metal-hydride battery pack for a more-efficient lithium-ion unit for better fuel economy, which we cover below. The Prius Three trim level is equipped with more convenience features such as softer interior materials, a 7.0-inch touchscreen, wireless cellphone charging, and a pearlescent white trim that appears to be a scratch magnet. Prius Three Touring adds synthetic leather seating surfaces instead of cloth. Toyota’s larger 11.6-inch touchscreen is standard on Prius Four and Prius Four Touring trim levels. Those versions add heated front seats and a power-adjustable driver’s seat. Power passenger seats, blue contrast stitching, and automatic wipers are offered on the Prius Four Touring trim. A head-up display and parking sensors are offered as options on Prius Three, Prius Four, and Prius Four Touring trim levels. Vegans take note: no Prius uses real leather upholstery. 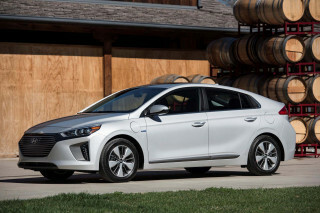 Prius Prime models generally follow the same convention with Plus, Premium, and Advanced trim levels receiving Prius Two, Prius Three Touring, and Prius Four Touring equipment, respectively. The Prius Prime makes standard an 11.6-inch touchscreen on Premium and higher trim levels. 2018 Toyota Prius = Expert-level efficiency badge unlocked. The 2018 Toyota Prius is one of the most fuel-efficient cars on the road today, but you already knew that. Opt for a Prius Eco, which cuts weight from the other trim levels, and those numbers improve to 58/53/56 mpg, according to the EPA. 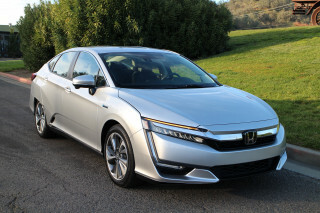 Looking for that black belt in fuel efficiency? That’d be the Prius Prime, which packs more batteries than the Prius and adds a plug for electron-only operation. It’s rated by the EPA at 55/53/54 mpg, but up to 25 miles of electric-only drive on a full charge on up to 640 miles with both tanks topped up. That’s bladder-busting range, according to us.